How To Choose the Right Trade Show Display For You | Displays and Exhibits, Inc. So you’ve decided to go to a trade show. Or maybe you’ve been to a couple shows, but you’re looking to prepare for your next one. Either way you’re in the market for a trade show display and you’re looking to make an educated decision before your next purchase. But there’s so much information scattered throughout the web that it’s difficult to make sense of it all. Tension fabric? Pop ups? Are fabric pop ups different? And the most important question of all, how much is this ultimately going to cost you? So we’ve compiled a comprehensive breakdown of the most common types of trade show displays from least to most expensive, along with several pros and cons for each. The standard pipe and drape frame will typically be provided by the show contractor as a placeholder until you decide to bring your actual display in. However it is not uncommon to use it as your actual display. Oftentimes exhibitors will use the fabric drape as a solid color backdrop to their booth and supplement it with banner stands. Pros: The display is free so if you’re on a tight budget and you’ve decided you absolutely do not need a display, then by all means feel free to cut it out and use this system instead. Cons: Again it’s free, so that should give you an indication into how commonplace these will be. You won’t win any awards for most creative booth design or leave much of an impression on attendees or other exhibitors. Tension Fabric Displays are like Pipe and Drape’s more stylish and better looking twin. The interior construction is nearly identical, but unlike drape fabrics that sit lazily atop the frame, a tension fabric display is pulled taut over the frame. This tension creates a clean wrinkle-free backdrop that will add some life to your exhibit when paired with a good graphic. Other names for tension fabrics include: Wave Tube displays, EZ Wave, EasyFabric, and WaveLine. Cons: Like most fabrics, a tension fabric display will slowly fade with time. It won’t happen quickly, but one day after setting up, you’ll realize that your graphic doesn’t pop like it used to. Fortunately, you can always have a replacement graphic printed for your display. The staple of trade show displays. If you’ve attended a trade show in the last 30 years, you’ve undoubtedly seen a pop up display before. They’ve been around for decades and their design has remained unchanged because it’s damn near perfect. In fact, it’s the only display on this list that has both fabric and printed graphic options. However, it should be noted that the frames have slight variations so you cannot repurpose a fabric pop up into a graphic pop up or vice-versa. Pop up displays are often also called: Coyote Displays (for graphic pop ups), Big Wave (for graphic pop ups), and Hop Up (for fabric pop ups). Pros: If tension fabrics are the lightest display on this list, then pop ups are the most effortless. The frame collapses like an accordion for easy transport, but still remains ready to pop up at any time (pun intended). Cons: Pop up displays are to trade shows as “Don’t Stop Believin'” is to drunk karaoke. They’re a timeless classic that’s become a little unoriginal with time. Everyone has pop up displays like everyone loves singing screaming, “JUST A SMALL TOWN GIRL”. However, unoriginality aside, both remain popular because they both accomplish what they set out to do. 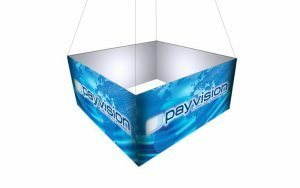 The slatwall display is a fairly new item in the trade show industry. Most people are familiar with slatwalls for retail or home use, but those models tend to be large heavy panels that aren’t easily transportable. These slatwall panels are 2′ wide by 2′ long and weigh less than 5 pounds each. Every panel is the same but using a variety of different hinges and connectors, you can create a wide array of pieces from pillars to displays. Pros: If you’re planning on bringing an extensive product selection like Core Bamboo above, slatwalls are a perfect solution. Allowing attendees to touch and feel your products is a great way to invite people into your booth and displaying your products on slatwalls will allow you to mimic a retail environment on the show floor. Additionally because slatwalls are composed of individual panels, you can custom create any shape you want as long as the connectors allow for it. Cons: Some ALL assembly required. Slatwall panels are like the Lego bricks of the exhibiting world. You can create a lot of unique models with them, but you’ll need to build it piece by piece. And of course, at the end of the show you’ll need to dismantle it piece by piece as well. The connectors also look very similar to the untrained eye, so it’s best to have someone familiar with the system assemble it. Imagine that it’s a week before your show and your company decides they want a video screen added to your booth. How would you add it? You could buy a TV stand and put it off to the side where it will look like a last minute addition. Or you could invest in a modular display and be prepared for this and any similar situations in the future. A modular display is equipped to add and remove features as you see fit. Shelves, TV & iPad mounts, counters, and slatwalls are all possible with a modular display. Pros: Modular displays are the DIY version of a custom exhibit. You can customize your display as you see fit and alter it as your needs change over time. Cons: The modular display is sort of like a Swiss Army Knife. You’ll be equipped and ready for any situation, but you may find yourself using the same two features repeatedly. If you’re looking for something directly in line with your needs, then you may be looking for a full custom exhibit. Unlike a slatwall or modular display which can be customized to become a structure that works for you, a full custom exhibit will be built from the ground up specifically for you. Should you choose this option, then our friends at Absolute Exhibits, Inc. can help you get started down this path. Pros: An exhibit tailor made for you? It doesn’t get better than that. You’ll have a personal team assigned to you, including an account executive, a graphic designer, a 3D engineer, a project manager, a pressman, and several builders in charge of installation & dismantling your booth. Each one of them committed to turning your vision into a reality. Cons: Cost. Designing a structure from scratch that can be assembled in several days, occupy tens of thousands of people, then be dismantled immediately is not cheap. Keep in mind that the projected “$8,000 – 10,000” budget listed above is only for a 10′ x 10′ booth. Most custom booths end up costing several times that amount and some of the biggest brands like Sony or LG can be willing to spend as much as $100,000 per show.